The Travelin' Lundburys: JOYEUX NOËL FROM PARIS! 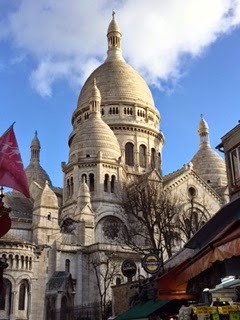 I woke up this morning to the sweet sound of David saying "Merry Christmas, we're in Paris"--just in case I'd forgotten! We woke up slowly; sipping several cups of coffee, having a nice Christmas breakfast, while our Christmas music played softly in the background. We were also treated to the sound of church bells all around us--we heard "Oh, Christmas Tree" and "Silent Night"--what a lovely way to start our Christmas Day. Our plan for Christmas dinner was to cook a small, simple meal at "home". We had checked out some local traiteurs a few days ago, and found one that would be open on Christmas day. They had delicious looking roast chicken, as well as several side dishes. Perfect! 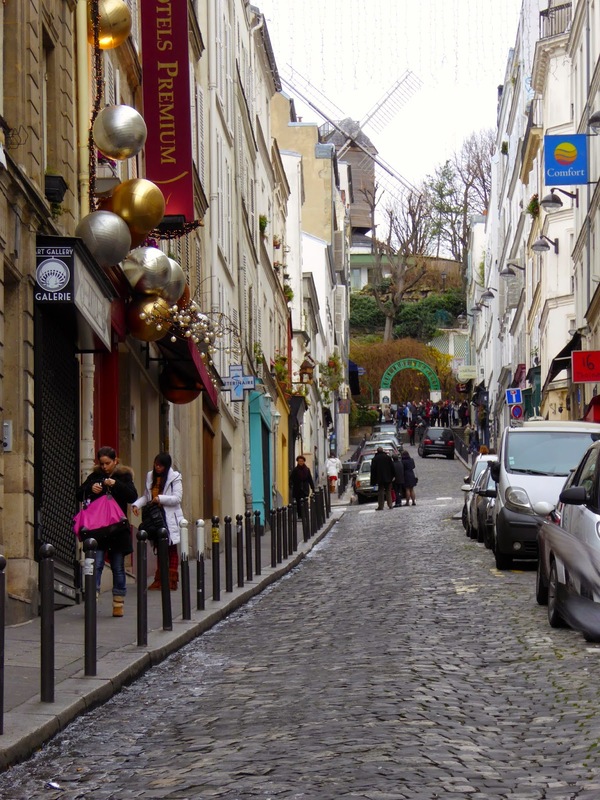 We wanted to get that part of our day out of the way, so we left the apartment about 10 am, walking arm in arm through the streets of Montmarte over to Rue Lepic. 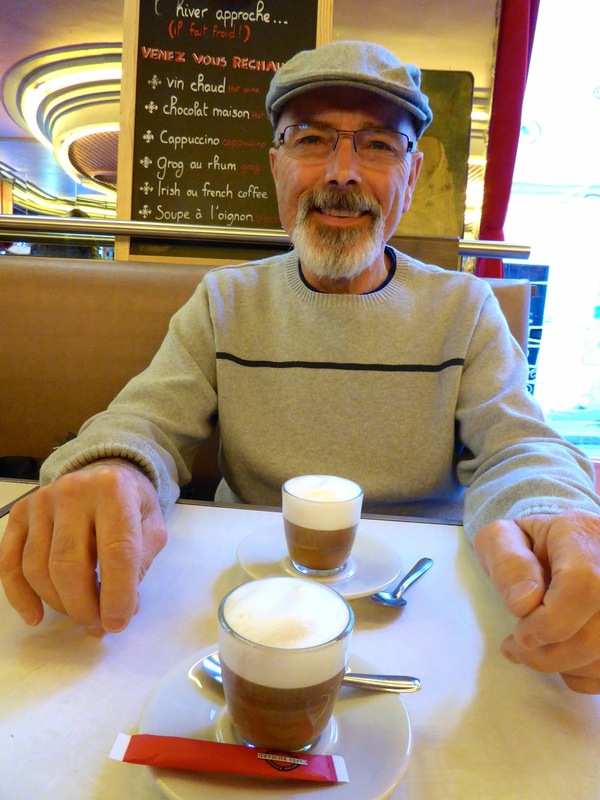 The traiteur was open, but their chicken wasn't quite ready yet, so we treated ourselves to a couple of noisettes at Cafe de Doux Moulin--or the "Amelie Cafe". It was quite a fun atmosphere, with the waiters looking quite cheerful in their Santa hats! We stopped back by the traiteur, but no luck yet, so we decided to walk back home and relax for an hour or so. We stopped along the way to buy some roasted chestnuts--mmmmm good! We were surprised by how busy the streets were. There were lots of people out and about, but not much car traffic--it was kind of nice for a change. Most of the stores were closed, but we noticed many restaurants were open. Although our corner bakery was closed, there was one bakery on Rue des Abbesses open--and the line was out the door and down the block! We relaxed at home for a while--listening to Christmas music and having another cup of coffee. I was feeling a tiny bit homesick for family, just as I knew I would. It seemed strange to not call them first thing in the morning to say Merry Christmas. But it's still the middle of the night at home--I don't think my family would appreciate a 2 am phone call! We walked back over to the "chicken place", and they were finally ready. The nice lady had them already packaged up for us, and she even offered us a glass of champagne as a Christmas toast--nice! Here's David carrying our yummy dinner home--Christmas "Dinner in a Bag". And yes, he rolled his eyes at me for making him stop for a picture. After putting our dinner in the fridge we set off for the Dali Museum. Kind of a strange thing to do on Christmas Day--but it was open, in our neighborhood and we didn't want to stay in all day. It was on our radar for this trip, anyway. It was quite a hike--STEEP sets of stairs and hills, whew! 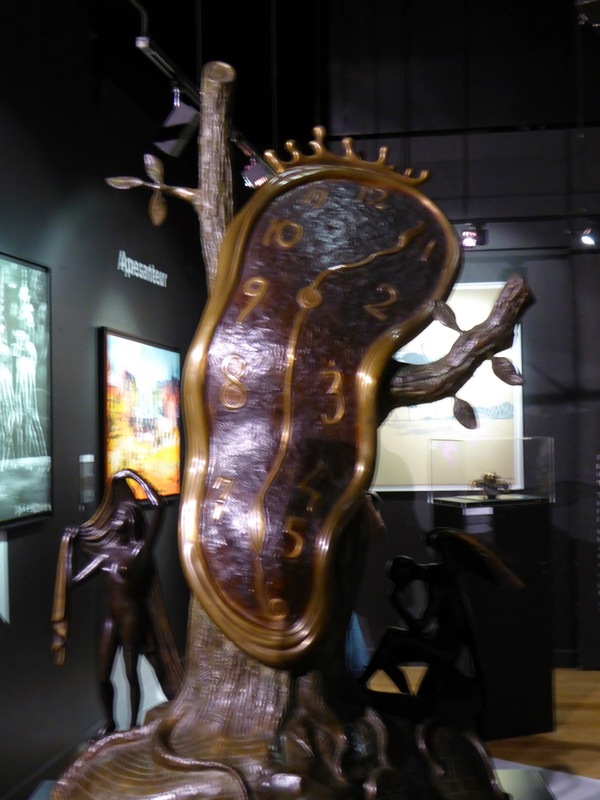 Dali's work is very interesting. David liked it more than I did; I much prefer Picasso's strangeness to Dali's strangeness. 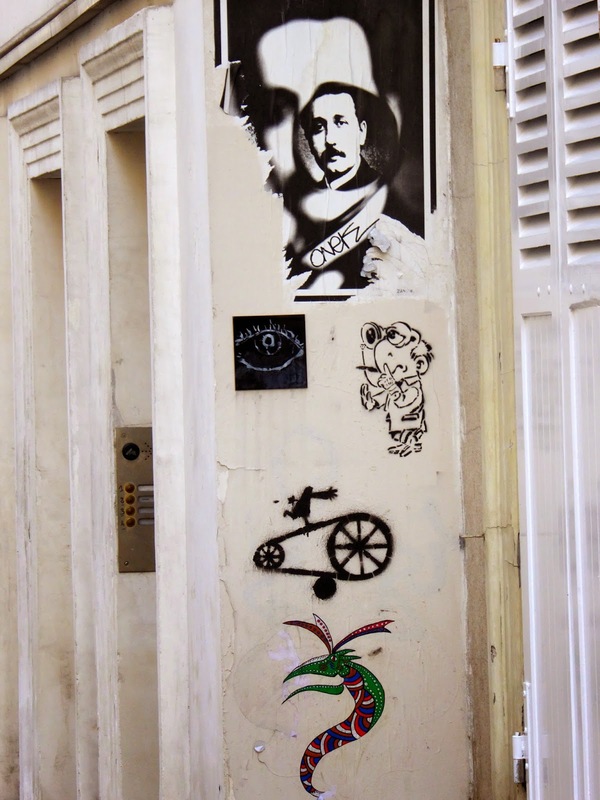 For some odd reason, Dali's quirkiness seems a bit contrived, and Picasso's seems very natural and authentic--just my opinion! We both enjoyed this small museum, it's very well put together and well signed, both in French and English. They were busy there today, lots of other tourists must have had the same great idea! Time just keeps slipping', slipping' away………. We were very near Place du Tertre, so thought we might as well have a walk through. It was REALLY busy! Place du Tertre a very charming square with pretty buildings all around. The center of the square is filled with local artists--both real and faux. I'm guessing most of them are faux "arteeeests", wearing their signature black berets and wielding their paintbrushes. Many of them are doing portraits, some good, many not so good. It's a very "touristy" spot, and not one I'd choose to visit more than once. 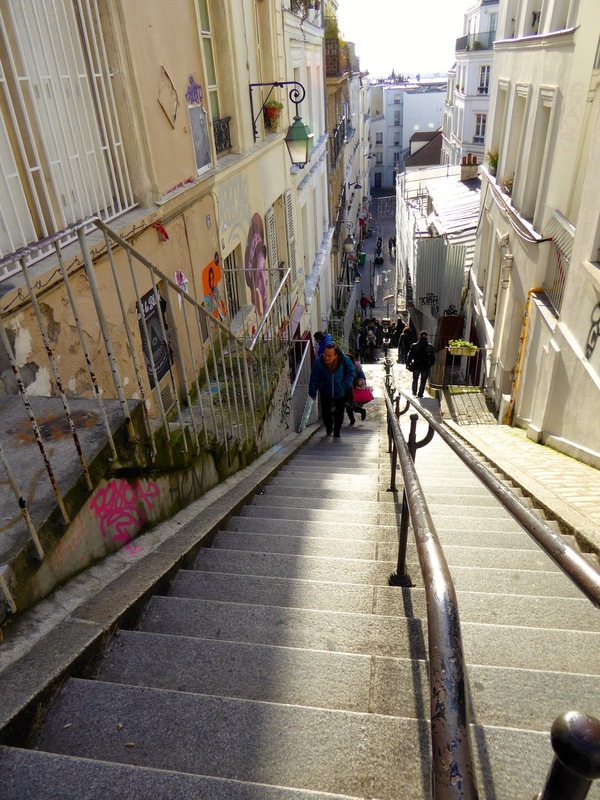 We wound our way down the hill--the line for the funicular was long, so I braved the stairs. My poor old knees complained all the way down, but I survived! We continued on down the hill, picking some new streets to explore along the way. 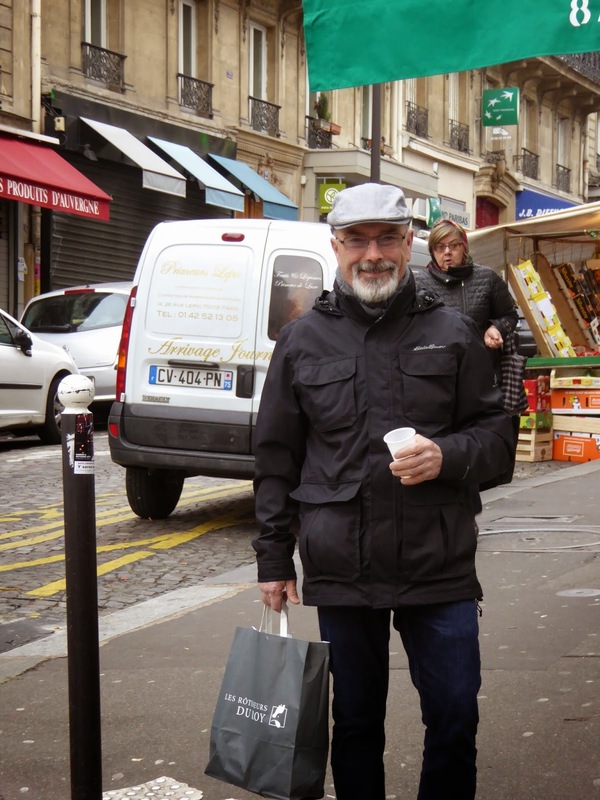 It was very peaceful on the little side streets, and we soon found ourselves back on bustling Rue des Abbesses. It was now about 3 pm, and we thought it was about time to mosey on home, think about starting our Christmas dinner and calling our families, but then I had a brilliant idea! We stopped at a small bistro for a Christmas Dinner appetizer. Yes, we are being very indulgent this trip! We ordered a plate of 12 escargot and a couple of glasses of wine. We enjoyed every last one of those delicious, garlicky, buttery, slimy little things! I wondered aloud if we could have a little snail farm in our backyard at home. David looked at me like I'm crazy--just like he did when I wanted to grow our own hops to brew beer. Sheeeesh! After that delicious little break we made our way home, where we put on our Christmas music, changed into our "comfy clothes" and relaxed for a few minutes before starting dinner. AND……that's when the fun started! WE SMELLED SMOKE! It was coming from the KITCHEN! David got up to check it out, and smoke billowed out when he opened the door---very scary! Now--earlier in the week, we'd noticed a woodsmoke smell in the apartment, with one evening being especially strong and unpleasant. We emailed the manager with our concerns, telling her that nothing was on fire, and we assumed it was just an issue with a chimney downdraft in an old building, etc. We agreed to monitor it, and in fact it did get slightly better for the next few days. We just kept the kitchen door closed, and put a towel at the bottom to keep the smell out. But not today--it was very scary, and simply intolerable! We made an emergency call to our apartment greeter, Georgina, and she was at our door in under an hour. She was shocked and worried about the smoke, and David walked around the building with her to see if we could smell it anyplace else--but it seems to be only in "our" apartment. Georgina is so sweet, she was very worried about the nice older woman that lives a couple of floors below us. Before we left the building she tried calling her, and then knocking on her door--but no answer. We are all hoping she has gone out of town for Christmas. Georgina was wonderful and efficient! We had packed up all of our belongings while waiting for her to arrive, and she had already made arrangements for us to stay the night at another of their apartments just a couple of blocks away. She cheerfully helped us lug our two suitcases, duffel bag, backpacks and bags of food through the neighborhood to our new place. We're just semi-settled in, as we didn't bother to unpack much. This apartment is not available for the rest of our stay, and they are almost fully booked. Hmmmmm--we might be homeless for the next week. Actually, I'm very sure they will find something for us, they are a great agency to work with and very highly regarded. And our lovely little Christmas Dinner? Didn't happen! We are both just worn out, frazzled and stressed. But at least we can laugh about it--our new code word is "SMOKIN'!! Yup, these Travelin' Lundburys are Smokin' in Paris! Literally, unfortunately. We smell like we've been sitting around a campfire for a week. About 8 pm we walked down to the corner, chose just about the first cafe we came to, plopped ourselves down and ordered a carafe of wine STAT! We enjoyed (ha!) very mediocre Christmas dinner, but we had a great conversation, good wine and laughed about our misfortune. We are still happy to be in Paris for Christmas, and we're remembering to count our blessings and be thankful for all we have--especially each other. So, MERRY "SMOKIN" CHRISTMAS from Paris, and stay tuned for the rest of the story……. Yikes! What an experience..... from the highs to the lows. I wonder what was causing the smoke. Not a good sign, I think! Not quite what you had in mind for a Christmas day in Paris. But.... it makes a great story/memory. Thanks for the street art. I love it. I posted some Boise street art on Facebook today. You sure are missed here in ole Spudville. Look forward to your return. Be safe. Hugs!